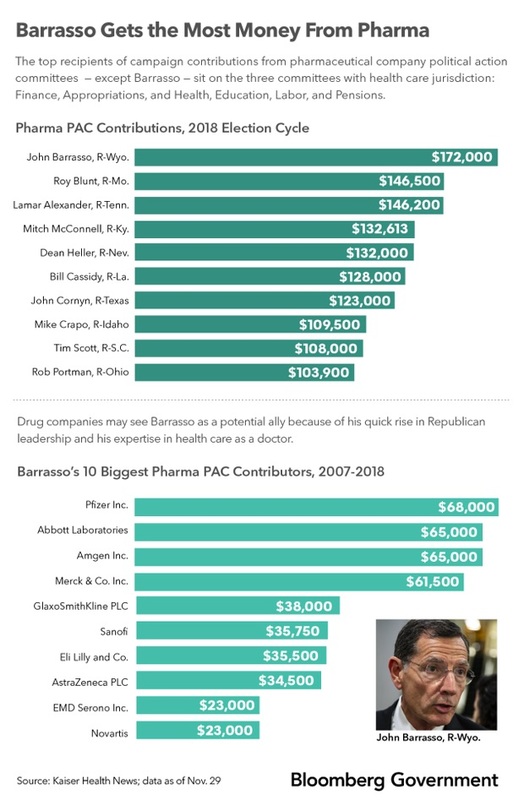 Pharmaceutical industry political action committees gave more to John Barrasso than to any other senator in the recent election, even though his committee assignments won’t put him in a particularly good place to drive health policy. But Barrasso (R-Wyo.) will be the third-highest ranking senator, Republican Conference chairman, in January and those donations could end up paying off for drug companies in the new Congress. The pharmaceutical industry is facing a House led by Democrats who want to push for strict drug pricing measures and an administration that’s criticized the industry and put forward regulatory changes aimed at lowering drug prices. Meanwhile, the drug industry’s main supporter in the Senate, Orrin Hatch (R-Utah), is retiring at the end of this Congress, spurring a dash for about 30 pharmaceutical companies and industry groups to find their new defender. “The brand-name industry needs to turn to someone to fill that void and beat back interest from the Democratic-controlled House … on the government’s role in setting drug prices,” Paul Heldman, managing partner at the health policy research and analysis firm Heldman Simpson Partners, said in an interview. Senate Republican leaders will likely “be the backstop of legislative proposals that would, for example, allow direct government negotiation of Medicare part D drug pricing,” Heldman said. Campaign contributions by drug industry political action committees overwhelmingly went to Barrasso. He received $172,000 from the industry in the 2017-2018 election cycle and is one of only three doctors in the Senate, according to Kaiser Health News. Pharmaceutical companies nearly doubled what they contributed to Barrasso during the 2015-2016 election cycle. Barrasso received more political action committee contributions during the last two years of his six-year term from the pharmaceutical and health products industry than from any other category of PACs, according to an analysis of Federal Election Commission reports by the nonprofit Center for Responsive Politics. “As a doctor, I continue to work to make sure people can afford their medications, so I’m going to continue to work for that. I also want to make sure they have safe medication and effective medications,” Barrasso said in an interview. Hatch sees Barrasso as an “ally” on health care. “I expect Senator Barrasso to continue to serve as a leader on critical health-care issues,” Hatch said in a statement to Bloomberg Government. Barrasso also received significant support from PACs in the oil and gas industry, and the electric and utilities industry, the Center for Responsive Politics analysis showed. Each industry makes up about 8 percent of Barrasso’s total $5.55 million contributions from PACs in that period. The typical reasons for industry to contribute to a senator’s campaign are the committees where the senator sits, being in a tight race, having a lot of that industry in the senator’s state, and the senator having sponsored bills related to that industry in the past. When it comes to the pharmaceutical industry, none of those apply to Barrasso. Nevertheless, he received the highest contributions from political action committees connected to Abbott Laboratories, Merck & Co. Inc., Amgen Inc., Eli Lilly and Co., and Allergan PLC. NOne of the companies responded to multiple emails and phone requests for comment. Ten other Republican senators received more than $100,000 from pharmaceutical company PACs over 2017-2018, and all are on the Finance, Appropriations, or the Health, Education, Labor, and Pensions committees, except one. The best way for drug companies to show their support of members of Congress is to contribute to their campaigns, even if they’re in a safe seat, Thomas Miller, a fellow at the American Enterprise Institute, said in an interview. That allows Barrasso to have broader power by giving other Republicans money for their campaigns, he added. Barrasso has established himself as a credible conservative voice in health care as a doctor and an outspoken critic of Obamacare, a former House Republican aide involved in health care said on the condition of anonymity. It wouldn’t be surprising for Barrasso to play a more active role in shaping health-care legislation with Hatch retiring, the former staffer added. “He’s certainly a very consistent, reliable person” who can talk about policy with depth behind it, AEI’s Miller said. If drug companies are looking at doctors for potential allies, only three currently sit in the Senate: Barrasso, Bill Cassidy (R-La. ), and Rand Paul (R-Ky.). But industry consultants say it is unlikely either Cassidy or Paul would become their main ally. Barrasso is a more reliable conservative, and being in leadership gives him an outsized voice, according to a Republican pharmaceutical lobbyist speaking on condition of anonymity. Another potential industry supporter is Sen. Richard Burr (R-N.C.). Lauren Fleming Paulos, Hatch’s health care legislative assistant, said at a BioPharma Congress event that Burr would probably likely step up to fill Hatch’s shoes when it comes to issues related to the pharmaceutical industry. North Carolina is home to many pharmaceutical companies. Burr has received the most campaign contributions from drug companies since 2007, a total of more than $1 million, but he said he would not seek reelection in 2022. He is more focused on overhauling the Food and Drug Administration than on pushing the drug companies’ agenda, one Republican lobbyist said. And Burr is chairman of the Select Committee on Intelligence, which has been busy with its investigations into President Donald Trump. It remains to be seen how much Barrasso will help drug companies with their agendas, but as a physician and GOP leader, he is likely to keep a focus on health issues in the 116th Congress.